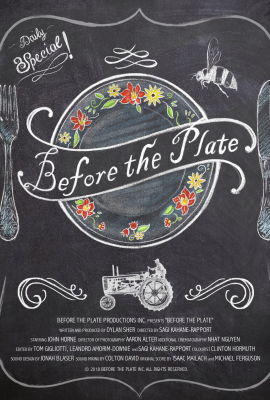 "Before the Plate follows John Horne, one of Canada’s most renowned chefs, on an epic journey as he follows each ingredient from one plate of food back to the farms they came from. Beginning in John’s prestigious restaurant Canoe, located on the 54th floor of a downtown Toronto highrise, John’s journey takes him from the busy, urban city to the rustic, rural origins of his ingredients. During his voyage, John investigates some of the most pressing issues facing farmers today, and discovers what it takes to produce food in a rapidly evolving agricultural landscape. Enjoy a rare look at today's food system, as the worlds of agriculture and cooking come crashing together in one mouth-watering Canadian food story.